Goodbye strict bedtimes, homework, and crazy schedules, Summer is here! My family is ready to relax and spend lazy days poolside, soaking up the sun and splashing our way to new memories. Living in beautiful Florida, having a swimming pool nearby is practically a necessity because the heat and humidity are overwhelming. Once my kiddos hit the water, it’s impossible to get them out again, even to eat lunch! And honestly, I’m not thrilled about puddles all over the floor and sopping wet towels strewn about my kitchen so I’ve adapted and usually serve lunch poolside. 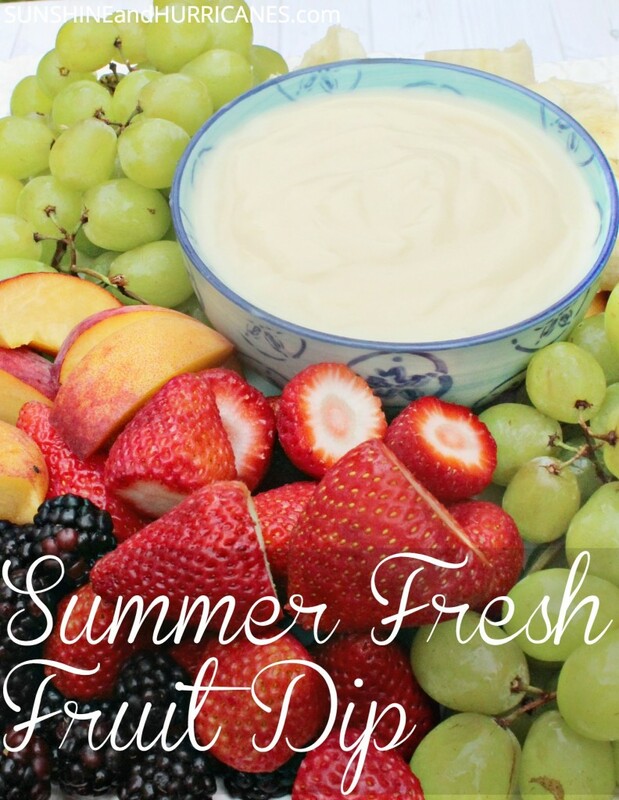 One of the frequent requests is for pizza and my super easy Summer Fruit Dip. This is a winner for me because nothing could be simpler and it’s a meal, as a mom, I feel good about serving! Our Summer schedule is quite a contrast from our school year one and I am thankful for that. I love all four of my kiddos at home, the house filled with laughter, and the freedom to schedule nothing but FUN! A normal part of our Summer routine is inviting friends over to splash away the day and even though none of the children want to get out of the water, I know they need to eat a balanced meal. One of the most popular lunches I serve is simple and full of delicious, high quality ingredients. 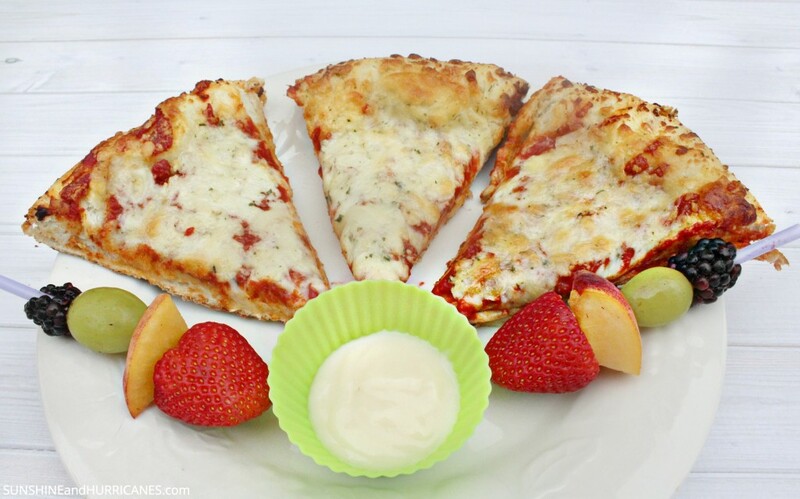 I start with a yummy Freschetta Pepperoni pizza that is always a hit with my swimmers. With 3 sun-ripened tomatoes in the sauce and 100% real provolone and mozzarella cheese, this is a pizza I feel good about serving. The convenience of popping a pizza in your own oven is a time and money saver, especially when you’re feeding a group of impatient kids! 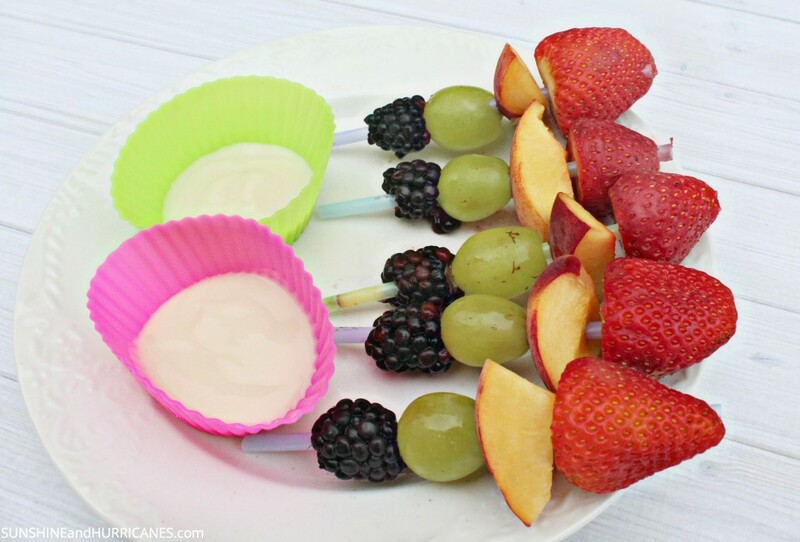 Alongside our Freschetta pizza, I serve fruit kabobs and a nutritious, delicious fruit dip! Kids just seem to love dipping things and this little treat is no exception! I raid the fridge for ripe, juicy fresh fruit and quickly stick it on a plastic straw, making a kid friendly kabob. I fill silicone muffin cups with my easy fruit dip and voila, you’ll have a healthy, fun snack to accompany your poolside lunch! Combine in a small bowl, serve alongside fresh, seasonal fruit. The kids love the kabobs but I also serve this scrumptious dip at parties or potlucks as part of a fruit platter and it’s always a huge hit! Sometimes I’ll create a double batch of fruit dip and use the additional dip in our breakfast smoothies, yummmmmmmmmmy! 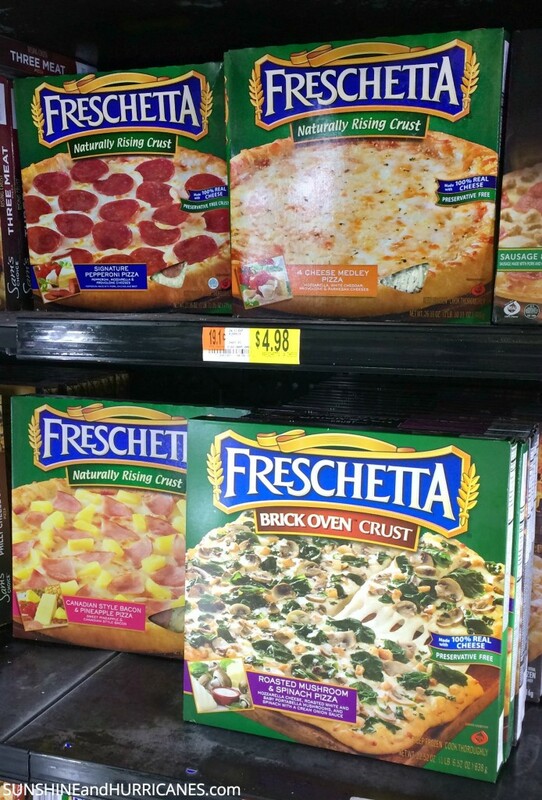 Keeping a few of our favorite Freschetta pizzas in the freezer means I’m always prepared when my pool is full of happy kiddos needing lunch with real taste. WalMart has a great selection(and price) on everything you need to help keep your Summer entertaining stress free! What are your tips to keep entertaining an easy experience for you and enjoyable for your guests? 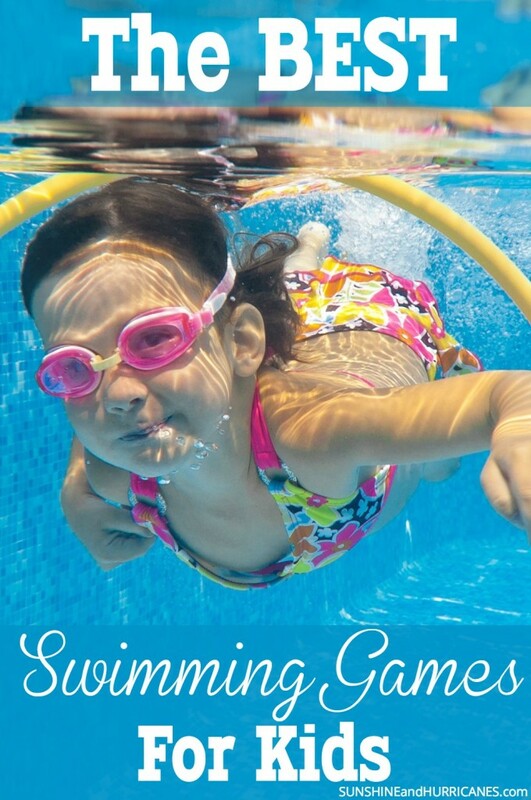 Be sure to check out our collection of the Best Swimming Games For Kids, there’s a ton of F-U-N waiting just for you! 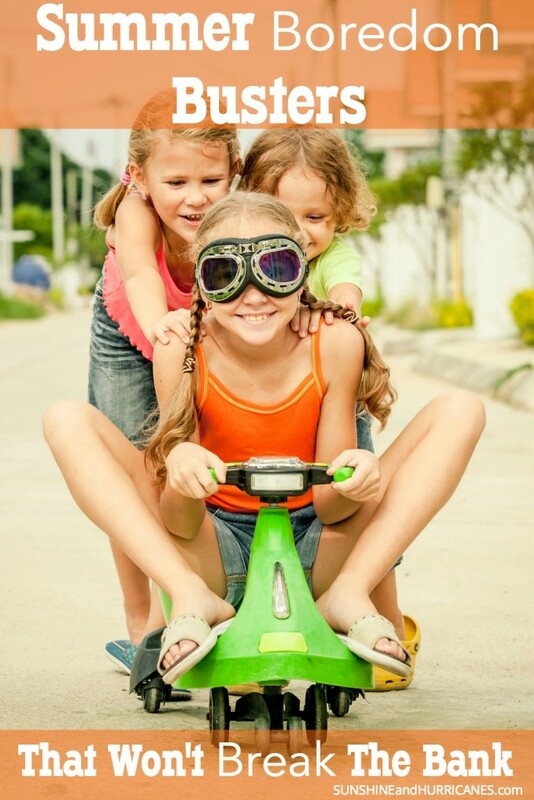 We’ve also got a whole collection of Summer Boredom Busters That Won’t Break The Bank, sure to keep the little ones entertained without ruining the budget! My kids are picky eaters but I know these days don’t last long. I always mean to document it and then share it with them years later but i never end up doing it. It’s so cool that you did just that! Fruit and pizza! Just a perfect combination ! Thanks for sharing your journey ! This was one of my favorite meals growing up! My mom also mixed peanut butter in the dip and it was delish! You’re on the right track in my book! Ok one thing I learned from this that I am TOTALLY stealing, is the use of the silicone cupcake liners for dressing! Genius idea! We eat so much fruit during the summer. Spring and summer seasonal fruit is the best. I love the beauty of outdoor lunch in a summer. So much easier to clean than letting kids take over the kitchen. And let’s not forget the ants. They need a bit of a feast too sometimes. 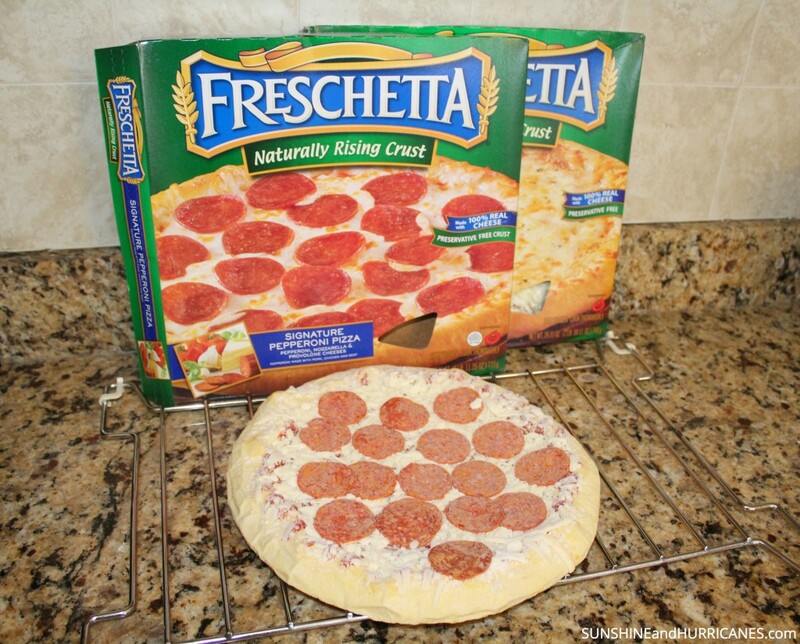 I love Freschetta pizza! I keep it handy all summer long as well. It’s such a delicious option when you need something quick and easy. My daughter does love yogurt and fruit, too. Nice and healthy options. I feel like I’m more strict about bedtime now that schools out. My little one is exhausted after being out in the sun all day… and so am i! This is really very easy! This sounds like a very lucky day, when kids play in the pool all day and ask for some simply cooked food. I cannot wait until June 28th, the last day of school here in New York City. These are the perfect treats for enjoying on those lazy summer days. This looks so good and it’s super easy to make. It’s also good since its also healthy which is always a plus! This looks really good. I need to make it for the kids. This sounds delicious! 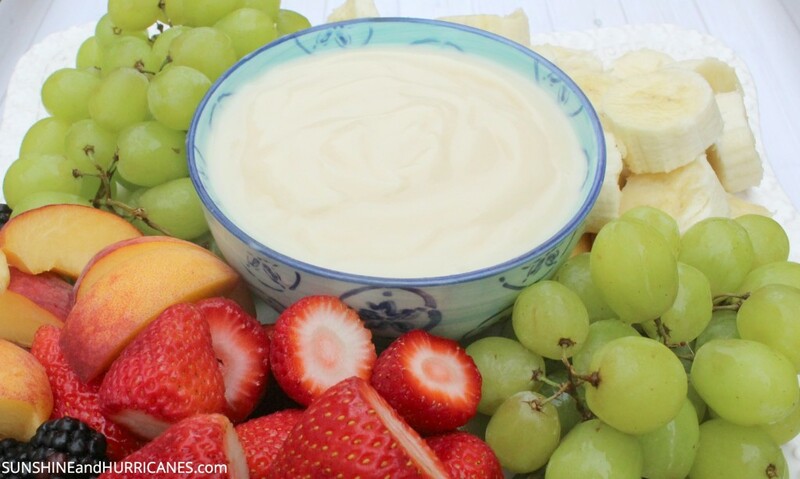 Yogurt and honey are always a great combination for summer and fruit! This sounds so good! I need to make a fruit platter for my daughter’s gradution, I think I will try this! What a perfect dinner for little people on the go. The fruit kebabs are fantastic. I could see my two tucking in. Super easy and delicious! Have you ever tried putting peanut butter, honey & greek yogurt together? It is delicious! This would be the perfect dip for a gathering! My kids would love it. YUM!1 This sounds like the lovely dip. I will have to make some for my next party. That fruit dip looks awesome and I can’t believe how simple it is! I’m definitely going to try it! Who knew that making fruit dip could be so simple?! That sounds absolutely delicious. I love eating fruit with dip and some pizza doesn’t hurt either! This dip looks so good. My kids and even my husband will really love it. I always have this at some party in the summer, but never found the recipe! I’m so excited to print this out and use it this year! Thanks! Omigosh SO TRUE. Sometimes I just cannot do it all and a Freschetta to the rescue is a wonderful thing for lunchtime around here! What a fantastic lunch! May I come join you? I used to swim all the time as a kid.